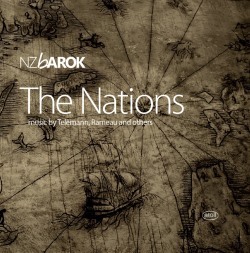 This mixed bag of baroque music is obviously intended to show off the skills of this New Zealand 'Barok' orchestra. The group recorded consists of nine violins, two violas, two cellos, one bass and harpsichord. The performances are enjoyable but lack a bit of the urgency offered by the obvious competition such as the Academy of Ancient Music. Whether this is down to the recording, which is rather recessed, apart from the harpsichord, or the variable interest of the repertoire, is a moot point. Their skill is not in question. Every member of NZ Barok has an impressive CV including several who have worked with elite European specialists. Baroque music-lovers in New Zealand must be rejoicing that they have this top class band available. The note explains their HIP approach as influenced by Dutch and Belgian authorities. The concert presented is intended to show the range of European regional styles current during the eighteenth century. Thus we have not just the characteristic dances of Rameau and Telemann but also Brescianello bringing Italian style to Northern Germany, the German Muffat using French and Italian features and both the Italian Geminiani and the English Boyce spreading Italian style in England. The Sinfonia by Brescianello is frankly rather dull and I also had difficulty getting much from the Muffat Sonata. However the remainder of the collection is either good, Geminiani and Boyce, or excellent, Bach, Telemann and Rameau, and here this group plays with more enthusiasm. Compared to the AAM's CDs on Decca the Boyce and Geminiani pieces are taken at steadier tempi and, combined with the backward recording, there is noticeably less impact. The AAM play the Boyce with oboes as well as strings, which does give more colour. The AAM also race through the Geminiani Op.3 concerto with superchargers engaged giving their recording the edge. No such issues with the Telemann which is the best characterised performance on the CD. I wish the notes had included the TWV number of this orchestral suite as well as its alternate name — I have added it above — because I cannot be the only person who likes to keep note of which of GPT's huge number of such works are in one's record collection. Telemann's piece, along with that of Rameau, most explicitly generates the title given to the whole disc because each contains named characteristic dances of many nations. All this is well detailed along with illustrations in Robert Petre's interesting notes for this well planned CD.